Ancient Stones - Borders - 054 Cow Stone, Brotherstone, St. Boswells. 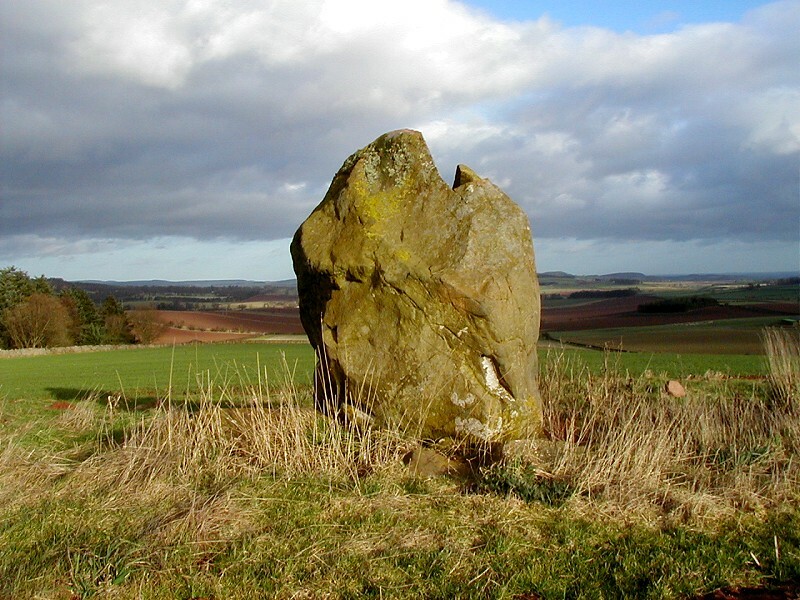 The Cow Stone is a massive erect boulder situated in a cultivated field on the north east side of Brotherstone Hill, some 115m from the two Brothers' Stones, both of which are fully visible, suggesting a possible relation between the two sites. The Cow Stone of irregular in shape, reaches almost 2.50m in height and measures 2.10m x 1.10m on plan. It's major axis points NNE and SSW and the base is packed with large stones. Brotherstone Farm is off the minor road running between Smailholm and Gattonside. Follow the main farm track uphill then veer right to Brotherstone Hill. 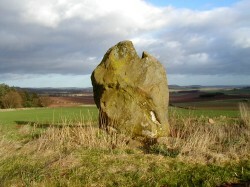 The stone will be seen in the field below and to the north west. Parking may be available in the farm yard at Brotherstone Farm but please request permission first. Numerous other stones resulting from field clearance can be seen round the field perimeter, some are of similar size to The Cow Stone and may have been associated in the past. There is probably an association with the 053 Brothers' Stones on the hill to the west.